This year at PhotoPlus Expo, all the rage was around mirrorless. Canon, Nikon and even Panasonic have joined the likes of Sony, introducing full-frame mirrorless cameras. But this begs the question — what’s in store for Olympus, a long-time mirrorless manufacturer using a micro four-thirds format? The micro four-thirds format was released by Olympus and Panasonic in 2008. While there’s been a handful of other micro four-thirds cameras made since its introduction, Olympus and Panasonic have been the heavyweights. With Panasonic’s announcement of its full-frame S1R camera, the company noted that they’re not abandoning micro four-thirds, just offering an alternative in the market. Despite that, many industry experts are worried about the future of the system. So where does that leave Olympus? I sat down with Aki Murata, Vice President of Sales & Marketing at Olympus, and Olympus Visionary Joe Edelman, to find out what’s in store. 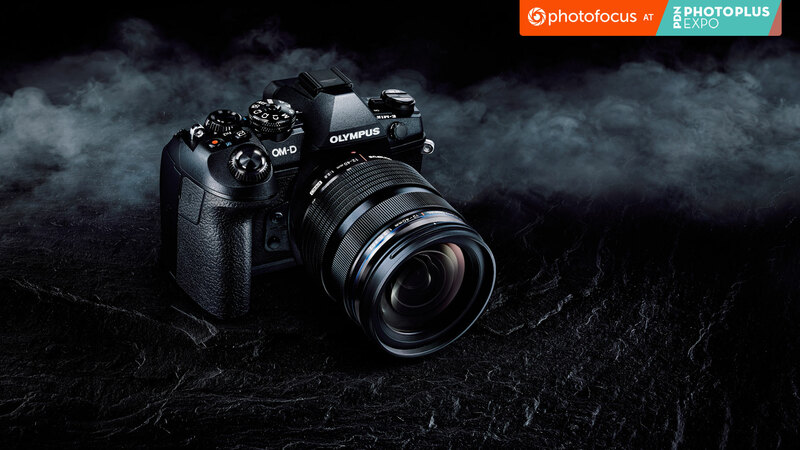 While Olympus might feature a micro four-thirds sensor, it includes many professional-level features, including 5-axis image stabilization, 4K video output, weather sealing, silent mode, High-Res Shot Mode, Live Composite Mode and more. For Murata and Olympus, mobility is the name of the game, which dates back to Olympus’ roots as a company with Yoshihisa Maitani, creator of the OM system. “[Maitani] said three things. We should provide ultimate reliability, a compact system and a lightweight system. This will differentiate us. He said we should be very unique, and stand out from others that way. “We want to provide mobility in the system. That’s why we don’t make full-frame — we will not make full-frame. It doesn’t make sense for us to do that. We want to provide cameras you can take anywhere and everywhere, and use them at any time. “If it makes sense to develop something new, we will. Based on our philosophy, we want to provide the best picture quality in combination with mobility — we believe that’s the best solution,” said Murata. While Olympus is all about quality and mobility, the company also recognizes and respects the need for a full-frame system. “We use our resources only on micro four-thirds, instead of developing a new system,” said Murata. We cannot give seamless experiences to our consumers [if we change]. It doesn’t make sense [to switch]. Very glad to hear this!!!! Very happy to read this article. As a long time Canon user, I took up MFT in 2014 after seeing a friend using the EM1. With my backpack dropping from 11kgs to under 5kgs for similar lens abilities it made a lot of sense for my body (and meant I was within airlines baggage allowances if checked, which has happened once). I know the compromises (depth of field, low light performance) but they either aren’t a factor to me or I can work around them (IBIS makes up for a lot of low light ability if hand holding, buy a prime lens). I still have my Canon gear and use it reasonably often, but the EM1 is my main camera. Having tried an EOS R recently (impressive bit of kit in very many ways) the body shaves 200gms against the 6D, and the 24-105mm f4 lens is heavier than the EF lens so can’t see the benefits for me. So pleased Olympus will stick with this format – it is like shooting with a camera the size and heft of the old films days with all the benefits of digital and mirrorless. And I hope Panasonic do stick with it – to have two OEM’s lens ranges to choose from is a wonderful thing. Couldn’t agree with you more, Michael! I was very happy to hear of Olympus’ commitment to the micro four-thirds system. In short: going mostly “pro high-end” is not making a large majority of the user base happy, it seems the largest majority of owners / buyers / potential buyers are *not* at that level in the market. Olympus is seen as starting to lose touch with the ‘meat’ of the market, not offering mid-level owners / buyers enough advancement to warrant buying (the OM-D E-M5 mk II is now 3 years old, still with a CDAF 16mp sensor, and we’re all still awaiting even a single scrap of information on its (hopefully far more advanced) replacement). You are out of touch like most in DPR. OLYMPUS HAS NOT ABANDONED SMALL AND LIGHT M4/3! What Olympus has done is EXTEND their catalogue to PRO line more, still offering small and light lenses and bodies. One system, something to everyone’s needs. I started being a pro 1973 and worked with 35mm, 6×6 and 4×5″ technical cameras, to do a wedding-shooting was a struggle for life. With 2 35mm body’s, 2 Hasslblad body’s, both systems with several lenses, Metz 60 CT1 flash and tripod i was on the road. 2 day i use just the my EM1 II plus 3 primes. So happy since i started to use Olympus FT E1 (and won the Dutch Award for Wedding) and so on the E3 , E 5, OMD Em 5, Em1 and now EM1II. So glad to see this article. I love my Olympic gear and look forward to shooting M43 well into the future. To my simple mind, the apparent number of Pro photographers converting from Canon and Nikon, to the Olympus E-M1 MkII supports the Olympus philosophy. In my Camera Club, there has also been a similar swing to Olympus. Long may this continue, as long as Olympus sticks to their strategy. I totally love Olympus , the high quality lenses and good feel ergonomically. Lets lok at the work that people produce please. Check out the Olympus Visionaries! Couldn’t agree with you more Jay. I’m an Olympus user myself, and I’m very, very happy with the output I receive! It’s all about the work, instead of who has the most megapixels or largest sensor size!